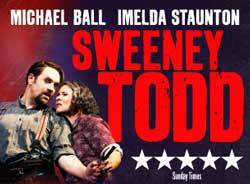 Stephen Sondheim will be at the Adelphi Theatre tomorrow for the first preview of his updated musical Sweeney Todd which he loved when it opened at Chichester last autumn. It is now set in the 1930’s and directed by Jonathan Kent with amazing performances from Michael Ball as Sweeney and Imelda Staunton and Mrs Lovett. Sondheim also oversaw a cast highlights album which it is hoped will be on sale by official opening night on March 20th.